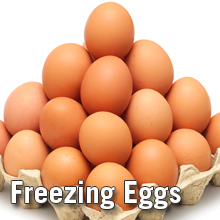 Eggs can be stored for at least 1 month, covered in the refrigerator. Freezing is often unnecessary, but it can be done. WHOLE EGGS — Thoroughly mix yolks and whites. Do not whip in air. To prevent graininess of the yolks, add 1-½ tablespoons sugar, 1-½ tablespoons corn syrup OR ½ teaspoon salt per cup whole eggs, depending on intended use. Strain through a sieve or colander to improve uniformity. Package, allowing ½-inch headspace. Seal and freeze. EGG YOLKS — Separate eggs. Stir yolks gently. To prevent graininess, add 1-½ tablespoons sugar, 1-½ tablespoons corn syrup OR ½ teaspoon salt per cup of egg yolks, depending on intended use. Strain through a sieve. Package, allowing ½-inch headspace. Seal and freeze. One tablespoon of the yolk mixture equals one egg yolk. EGG WHITES — Gently mix whites; do not whip. Strain through a sieve. No sugar or salt is needed. Package, leaving ½-inch headspace. Seal and freeze. Two tablespoons of the egg-white mixture equal one egg white. Source: This document was extracted directly from "So Easy to Preserve", 6th ed. 2014. Bulletin 989, Cooperative Extension Service, The University of Georgia, Athens. Revised by Elizabeth L. Andress, Ph.D. and Judy A. Harrison, Ph.D., Extension Foods Specialists.